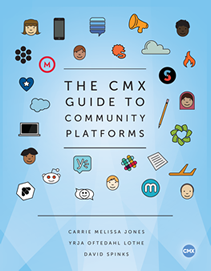 CMX has released The CMX Guide to Community Platforms, a free ebook that premiered at their most recent conference, but is now available for you to download by subscribing to their email list. It was authored by the CMX team: Carrie Melissa Jones, Yrja Oftedahl Lothe and David Spinks. I contributed to the guide, sending over some long form thoughts on community platforms when they put a call out to the CMX community. I’m glad they were able to make use of them. The 110-page long PDF provides general insights about choosing a platform and what to avoid. A wide array of currently-relevant platforms are profiled, broken up into several categories. These include forums, enterprise software, community feedback and support platforms, group platforms, content management systems, community relationship management, internal community and community that exists on outside platforms. In any space or product category, it is not uncommon for there be a bias toward options that are viewed as hip or forward-thinking, due to marketing or a trendy feeling of newness. Community circles are no different, especially in relation to the software we use. Discourse is a good example of a platform that benefits from a sense of newness. I believe that Discourse is a good, reasonable option if you are looking for forum software. But the difference between Discourse and phpBB amounts to the difference between two flavors of ice cream. My favorite ice cream when I was a kid was probably chocolate chip cookie dough (maybe it was mint chocolate chip). Chocolate chip cookie dough is awesome and a relatively new invention (supposedly brought to market in the early 1990s). But, even though you might prefer one over the other, chocolate chip cookie dough isn’t better than rocky road, just newer and different. That is largely how I view the forum software space. Though I think this bias might creep into the CMX guide here or there, they did a reasonable job of balancing it out. They could have just covered high-dollar value, enterprise platforms that most of us will never use. That would have left a huge gap in their guide, but they could have done it. That they covered forums and lower-priced options in this amount of detail speaks well of their broader understanding of the community space. It symbolizes the fact that CMX, first and foremost, is a resource for the community professional – not for software vendors or those who wish to reach and convert community professionals. Because of that depth, this is the best guide to community platforms currently available. My take on the guide is that it was created to help you more fully form an opinion, not make your opinion for you. While some of the author’s opinions come out, naturally, as do opinions of those who contributed, like myself, I believe it will be best utilized in pushing you to think a little bit more about your choice. I would then take that knowledge and demo at least 3 different options, if not more. Don’t just try the ones your industry friends are using or that you think you’ll like the most. Demo at least one that you suspect you won’t like – and do so with an open mind. You’ll be better for it.